Today's post is meant to be a sort of time travel, and a naive exhibition too. If I am always happy to repaint my old minis in today's standard, I also appreciate to bring memories back from the past, and to see these minis as they were. Before I finished to repaint all of them (I don't really worry, I am so slow, and I have so many of them), I took time today to take pictures of these old dear toys. I don't remember how long it took before I realized that these pencils could be used on other plastic minis... but as soon as it came to my mind, I started to color every mini I had. In those days, my 1/72 soldiers were Airfix and Atlantic. Many more years passed before I tried other techniques, and you can see the actual style on this blog. I hope you like them all, even the old ones. Do you have a similar experience ? You makes me curious, how similar ? Any pictures ? I still have some of that stuff. I'll see what I can dig up. Too old for playmobil, but I do love this thread! Now that brings my childhood memories. I had Playmobil figures (without pens) but they were in colors. Man, I really enjoyed them. PhilC we must be born in the same year! 1970? I am from the first Playmobil generation, in 1974 I bought my first playmobil: the road workers and construction workers with orange colored and grey tools. Those days they were boxed in translucent plastic with a paperboard back, it was before the well known blue boxes appeared. Around 1979 I think the white ones appeared in our village toy shop and I got the pencil set of six colors right away with it (because unlike you I understood right away what was the meaning of those white men ) Though my first selfpaint set was a collection of Playmobil table ware of which part was translucent. My daddy liked the self painting Playmobiles much more than the pre-colored plastic ones, because this stimulated my creativity, he said. As soon as possible I bought the 12 colored set and I think all in all I used 5 different pencil sets to get all my toys colored. 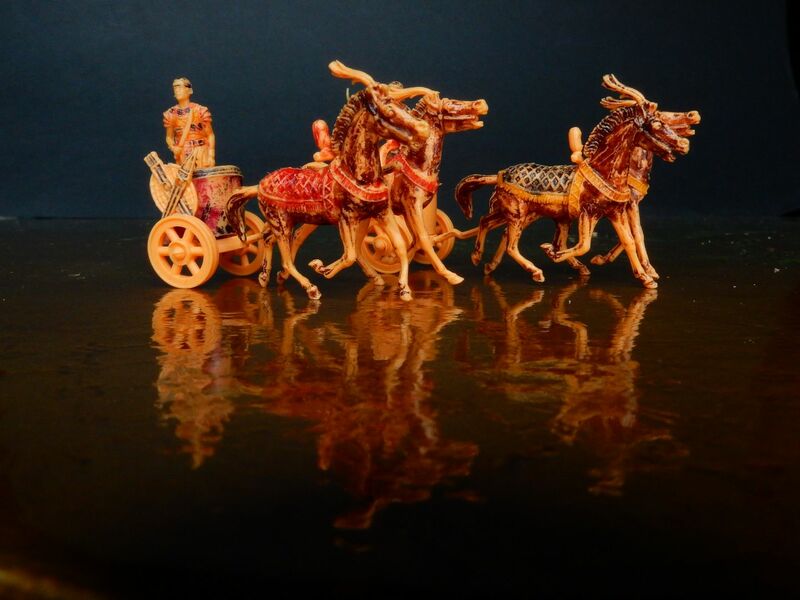 I had the prince&princess, huge Lansknechts set with wagon, 18th and 19th century soldiers a bit like you showed us above, Indians and cowboys and the motorgang, all of them painted with pencils. Immidiately (unlike you ) my big brother and I understood these pencils were useful for painting our Atlantic Egyptians, Romans and Airfix Cowboys. 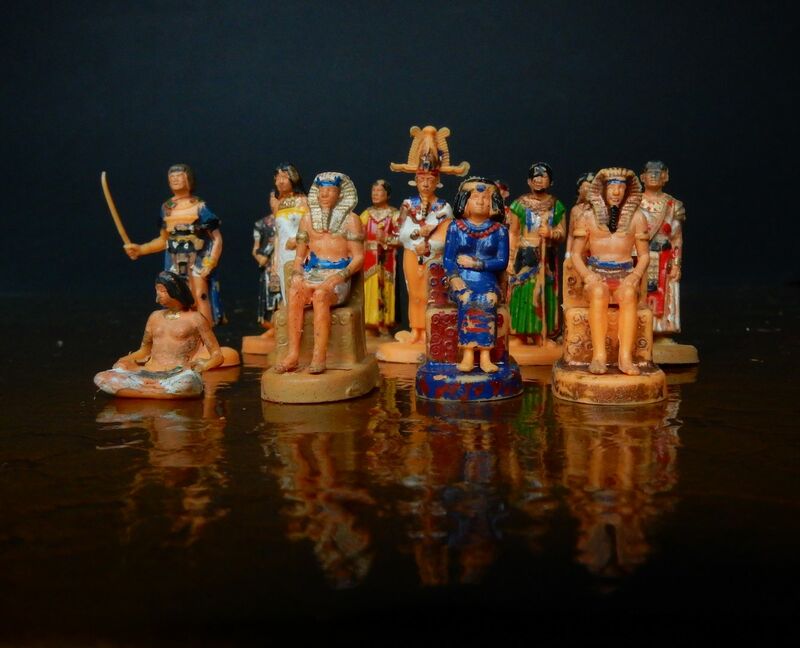 And a huge advantage was: our female friends who were not interested in soldiers and weapons, did love to paint the Atlantic Egyptians with those Playmobil pencils. You know, females always love ancient Egyptians. For the Atlantic Westerns it was a problem, because the brown plastic was too dark. But at least brown is acceptable for clothing, human skin tone and animals. So those brown figures were not the worst. The Airfix Waterloo sets were the real disaster: All those Waterloo guys wore soo much white in the uniform. The day I realized white color can never be achieved with such pencils, I cursed the whole Airfix Company for producing their Waterloo figures in yellow in stead of white. It should have been white! it should have been white! 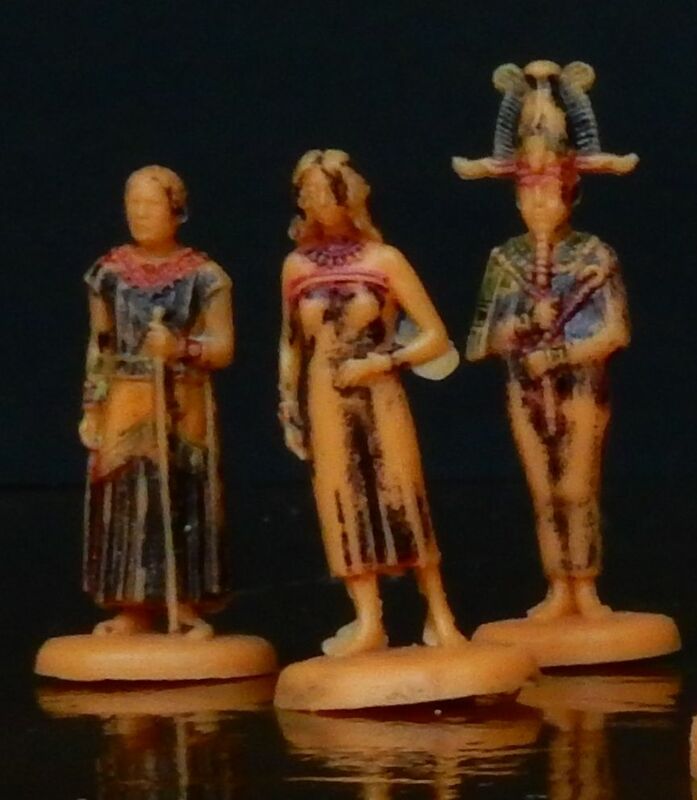 Atlantics ancients flesh color made much more sense: we only had to paint the hair and cloths, although white turned out the most important color for the Egyptians as well. I still have all those Playmobiles and some of the Atlantics in their original Playmobilpencil colors. It all changed of course when my brother bought his first green enamel to camouflage his complete collection of planes and tanks, all with that single dark, glossy color But it took me a year to discover there were other colors available too. Like MATT WHITE: the most usefull and beautifull color of them all. Looking back, it is interesting to realize a child does not recognize white as a color. Most of us are raised by using white paper to write and draw upon, and to paint on white paper or canvas. So white was always there, we never needed a white color. Until those colored plastics appeared in our lives. That confused many of us I think. Those figures are painted with Playmobil Colors as well. I was born in 1969, so I was the first Playmobil Generation as well. And the success was founded in the Netherlands. Because the first big order was placed from a trader there. I missed that nostalgia post of yours completely. MABO wrote: the success was founded in the Netherlands. Because the first big order was placed from a trader there. I did not know this. As a child I thought Playmobil was British because of its name. Why not Spielbeweglich? It must have been for international marketing reasons. A real pity we did not know each other already those days. I think I would have begged my parents over and over again to bring me to Bonn to play with that German boy having such a nice collection. I never had any Playmobil figures (and have no experience with their paints); I used the competing product called Play-Big. You could move each leg separately – clearly an improvement over the coupled legs of Playmobil. You could even move the feet in different directions! (No idea what this should be good for). And it is really pleasant to see those old Atlantic sets again; I had a lot of them. They are long gone, but some of them I have bought again as re-issues. The Egyptian and Greek civilian sets are really nice and IMHO still useful today. sberry wrote: I used the competing product called Play-Big. Though very uncommon in the Netherlands, some of us boys had Play-Big and they were another 'race' so natural enemies to our Playmobil. Remember the Play-Big horse? : the men did not fit the huge but realistic back of that animal. A part of the horseback had to be removed to mount a man, like a butcher had taken the best parts of the meat away while the horse was still running around. PhilC wrote: You makes me curious, how similar ? Any pictures ? These are all 1/72 scale. I can only see one reason why so much of the color has faded: because we played so much with these around 1979. We made temples and pyramids with mummies in the burial chambers. 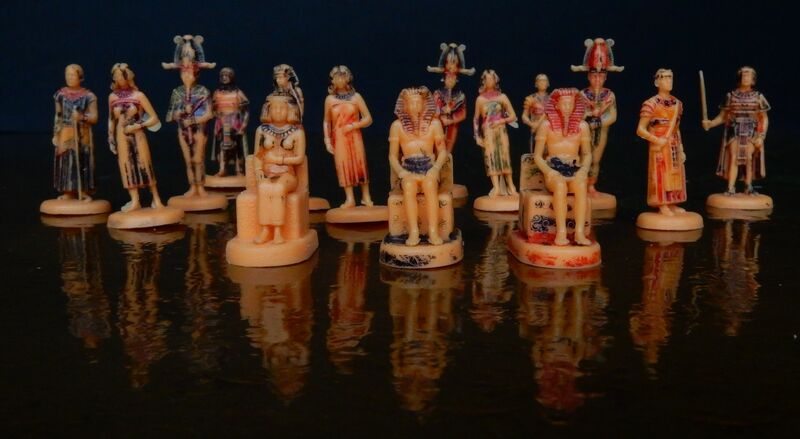 Most of them Egyptians ended up chopped up for conversions in my ancient Persian army around 1986. Thats why only some poses of these sets are left. Good evening all of you (evening in Europe) ! I am very happy with all your comments, these childhood memories are precious, funny to read similarities in our experiences. 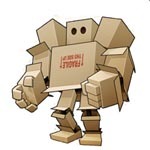 MABO, I love the picture you posted, and thanks for the links, I missed it, sorry. I recognize some of the Atlantic Trojans, I still have mine but they were painted (over pencil) years ago - I should take photos and post them one of these days. Mr Cryns, yes, your minis are very close to mine, even the faded colors are similar. My brother and I played a lot with with minis. In the best games we could have, we built fortresses, or even small cities with Lego bricks. One of us had to defend the city, while the other had to attack... we developed catapults with legos and elastics to breach the wall (which never happened) or at least put the defenders down. I used the competing product called Play-Big. Yes, I know them too, had a dozen ACW men with their big horses, and I clearly remember the way to mount them They were technically advanced, but not as cute as Playmobil maybe. All your pictures are great, thank you very much. Bluefalchion, I can't wait for yours !! And last (but not least), I must say, Mr Xryns, that your analysis of our perception (as children) of the white color is very interesting ( though I understand that my brain was not as fast as yours ). Just one element you missed: the white men are the male nurses, they were sent to bring you back to the hospital !! Mr. Cryns wrote: A real pity we did not know each other already those days. I think I would have begged my parents over and over again to bring me to Bonn to play with that German boy having such a nice collection. My plan is to paint all my old 1/32 Atlantic figures. But that is one of the projects I will realise after I am retired. I had Play Big as well and I still have their Wiking -Range. But my mother had given the rest away without asking me - not funny. Mr. Cryns wrote: Though very uncommon in the Netherlands, some of us boys had Play-Big and they were another 'race' so natural enemies to our Playmobil. Play Big was nowhere really popular, it seems, and so the stuff became extinct after some years. To be honest.... I think it was my big brothers brain that helped me through the difficult parts He was reading books all the time and told me all about it and then I started to build what he told me. I only looked at the illustrations in those books. MABO wrote: My plan is to paint all my old 1/32 Atlantic figures. But that is one of the projects I will realise after I am retired. Only 17 years to go MABO! Your painted 1/32 Atlantics look like a real treasure to me. 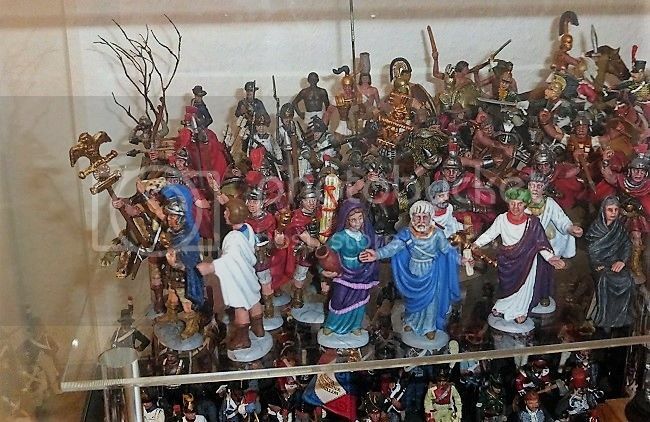 A bit like an Italian shop selling first class dolls for the Catholic nativity scene. And MABO thank you so much for your teenage film site. You look like someone trying to look like a director: a suit coat and moccasin shoes on the outdoor filmset. You don't look like that today anymore. So many memories of my own teenage filming came back when reading and watching your site. I watched your Playmobilmovie twice. There are some real good animated shots. Like men moving to the back of a truck, opening it, going inside. And nurses with patients coming out of a door and then in the foreground a tv camera is moving in and out without a cameraman handling it. Great! It is fascinating to see all over Europe and probably US and the Common Wealth Countries in the 1980's boys made similar movies. I remember a Norwegian man showing me his teenage Lego-Starwars episode. For lasergun shots he used red plastic wire that were only for some frames between the gun and the victim. He added voices to it too. This is my favorite quote: Viele Menschen kommen, nach der Pause sind nur noch wenige da, die bis zum Schluß bleiben. Ernüchterung macht sich breit und eine Blase ist geplatzt. sberry wrote: Play Big was nowhere really popular, it seems, and so the stuff became extinct after some years. Their proportions were more realistic as the Playmobiles. But children don't seem to care about proportions at all (some adults still don't seem to care about proportions at all ) But what we did not like about them was their emotional expressions on the faces: some were smiling, some were angry and some were crying. Even when they were having a party they were still crying. That disturbed us. To the contrary, Playmobiles going into battle with a big smile did not disturb us at all. This is an extremely sentimental thread. Wonderful! I have completely similar experiences as Phil, Mr. Cryns and Mabo. And I also used Playmobil felt tips to colour my 1/72 figures. Today I still have many of my figures from this period, thanks to my brother, who kept them for me for many years and only recently returned them to me. 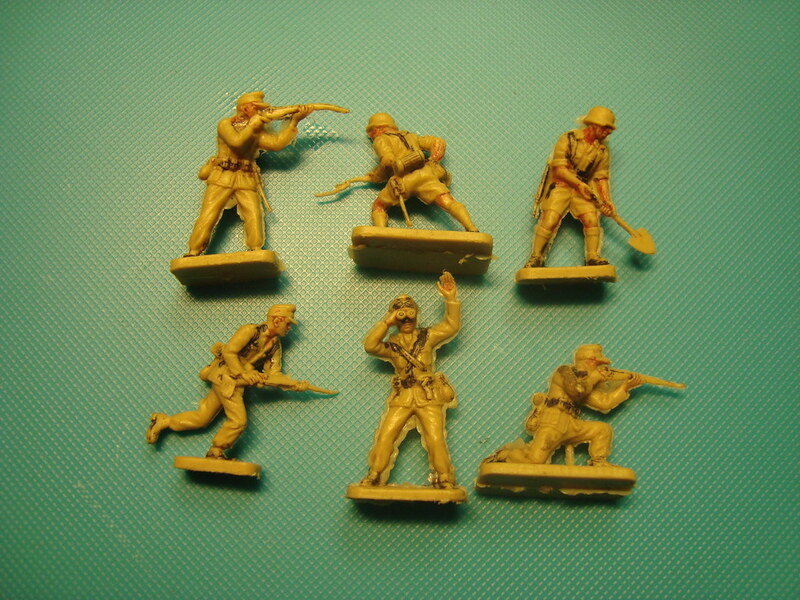 This is a picture I just took especially for this thread of a selection of 1/72 Airfix Afrika Korps figures. The webbing, skin, boots and weapons are coloured with Playmobil felt tips, but heavily faded over the years. I must have coloured these in the late '70's. And look at the flash, which seemingly didn't bother me then. And look at the flash, which seemingly didn't bother me then. And today we are all button counters.